There's immediately peat and smoke on the nose, nicely mixed with a delicate sherry sweetness and orange zests. Hints of gauze bandage emerge, followed by allspice, oak and cloves. Tender fruity with notes of apples and lemons, supported by tobacco leaves and subtle barbecue aroma in the back. A very pleasant nose indeed! Sweet and creamy on the palate with red apples and oranges, followed by vanilla and lingering sherry notes. Smooth but rich with lingering peat smoke, delicate black pepper and subtle oak spice. Nicely warming and mouth-filling. The finish is long, warm and slightly dry with oak and peat smoke. Sticky orange marmalade, gingerbread and dry notes of tobacco leaves on the tail. Drier on the nose when a few drops of water are added. Less sweet - but oak spice, notes of gauze bandage and ash emerge with a little orange fruit in the back. Bold and fairly spicy on the palate with cracked black pepper, prickling oak, allspice, ginger and cloves. Subtle peat smoke with creamy notes of oranges and apples towards the finish. The finish is still long but becomes very dry with oak, coal ash and a hint of peat smoke. 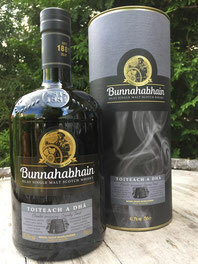 A lovely Mòine variant of Bunnahabhain's single malt. This selection from a combination of Ex-Bourbon and Sherry casks results in delicate sherry sweetness, fruity citrus flavours and pleasant smokiness with subtle coastal aromas and warming spices. A full-bodied single malt with a long finish. Excellent value for money, too.